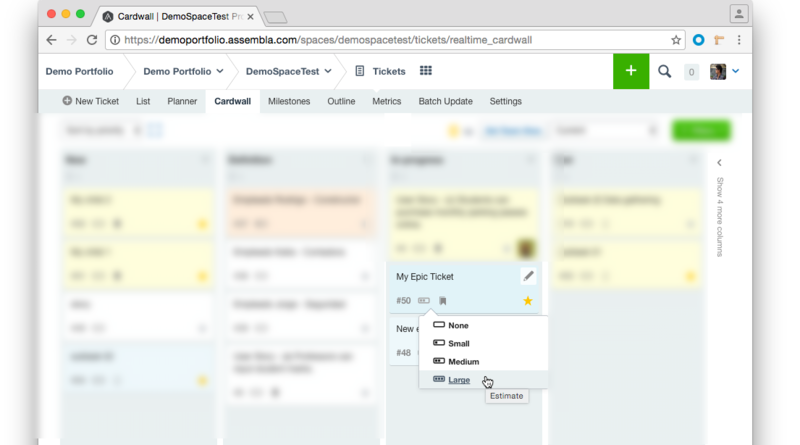 Assembla's Ticket Tool allows you to add estimates to tickets and show estimated size on milestones and status columns (cardwall view). Estimates can be shown in Time, Points, Size (Small, Medium, Large) or not be shown. Go to your Tickets tool > Settings > Ticket Fields. Choose how you want to show the estimates for tickets. 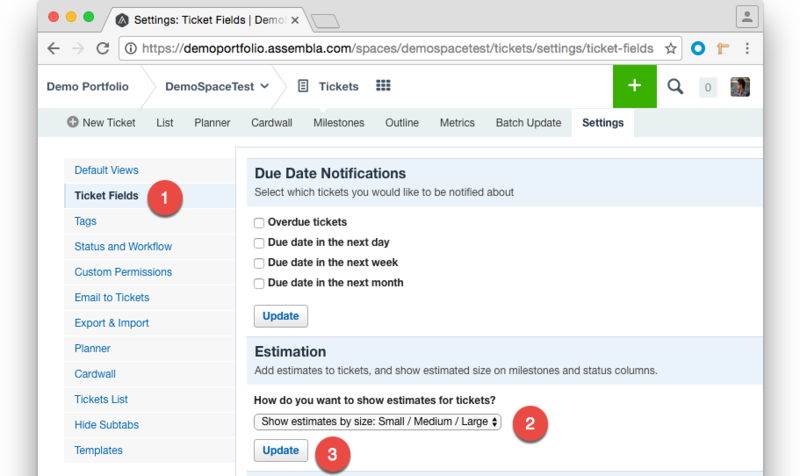 How do you want to show estimates for tickets? This will hide the estimates and set every ticket to 1 point. So, the Capacity measures will equal ticket counts, which is useful for a Lean methodology. This gives you a popup widget for estimating "Small" (1 point), "Medium" (3 points), or "Large" (7 points). This gives you an integer field for entering estimates. We match these points with a Capacity – the approximate number of points that your team can work on at one time. If you do not enter a capacity, and you do some work, then we will calculate capacity from historical velocity – the number of points in tickets that are closed in the last week. Estimates do not need to be accurate. Even simple estimates will help you work on approximately the right number of tickets. It is more important to sort your tasks in priority order. If your tickets are sorted correctly, you will always be working on the most important tasks. In the image below you can see how estimates are displayed in the Cardwall view. The bars in the estimate icon represent the size of the estimate. For example, three bars represent a Large size. If you wish to change the estimate you can do so by either going to Ticket Edit view or by clicking on the estimate icon.